After seeing how Egyptian mythology is depicted in the Shin Megami Tensei: Persona series of videogames (see Salvador, 2015), I now turn to another game series: Activision’s billion-dollar toys-to-life franchise Skylanders. The main series (i.e., discounting spin-offs) currently counts with six multi-platform games: Skylanders: Spyro’s Adventure (2011), Skylanders: Giants (2012), Skylanders: Swap Force (2013), Skylanders: Trap Team (2014), Skylanders: SuperChargers (2015), and Skylanders: Imaginators (2016). The games take place in a world called Skylands, a magical realm full of floating islands. Needless to say, this realm is under the constant threat of villains who want to conquer or destroy it and so it falls to the heroes known as skylanders to protect their homeland. Contrary to the Persona games, which only use gods and creatures from several mythologies around the world, Skylanders creates its own cast of heroes, villains and monsters. These characters are often based on real animals or on fantastic being from myths and stories from all around the world. There are elves, trolls, dragons etc. A few of the characters were inevitably based on ancient Egypt. As such, I will not analyze Egyptian mythology per se in Skylanders, but the many things based on ancient Egyptian culture that appear in the games. 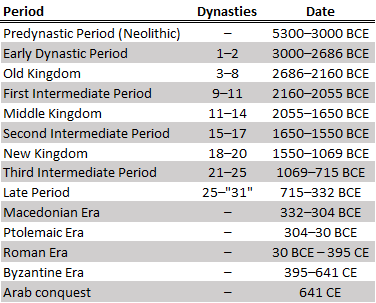 Some parts of the text will refer to periods of Egyptian history or dynasties of rulers, so the table below gives an easy reference for this, with indication of the dynasties of rulers and approximate dates of each period (according to Shaw, 2004). Dune Bug (official artwork from the game). 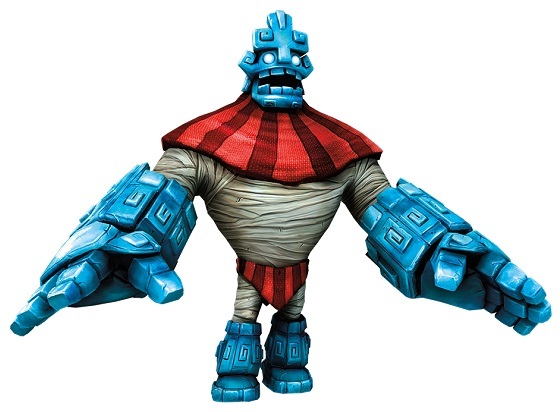 Image extracted from Skylanders Wiki. Dune Bug is clearly a scarab, a type of beetle belonging to the family Scarabaeidae. These animals are also known as “dung beetles”. This name comes from their mode of life: they make balls of dung that are used as brooding chambers for their eggs and as future food source for the larvae. Males roll their dung balls around and eventually fight for them; those that can protect a nice ball will get a good shot at reproduction. In most species, male beetles have huge “horns” on their foreheads that they use in these battles. 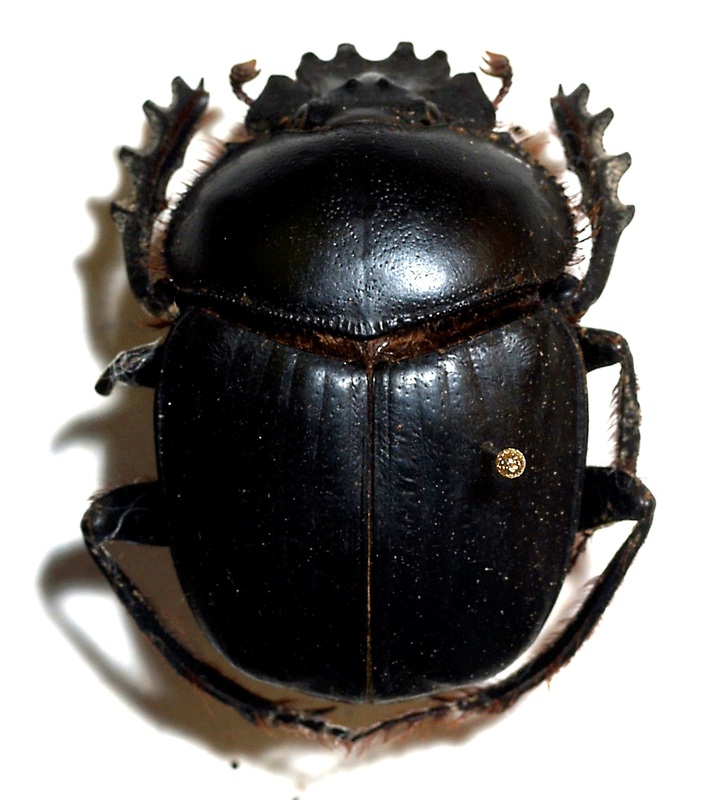 However, the Egyptian species (Scarabaeus sacer Linnaeus, 1758, or “the sacred scarab”) does not have such horn, so we can say Dune Bug is not very biologically accurate in this regard (not to mention he’s missing two limbs!). A specimen of Scarabaeus sacer from an entomology collection. Photo by Sarefo (2007); image extracted and modified from Wikimedia Commons. Anyway, why is the Egyptian scarab called “sacred”? The Egyptians observed the ball-rolling behavior of the beetles and considered it an analogy to the sun god Re (may also be written Ra) pushing the solar disk across the sky. 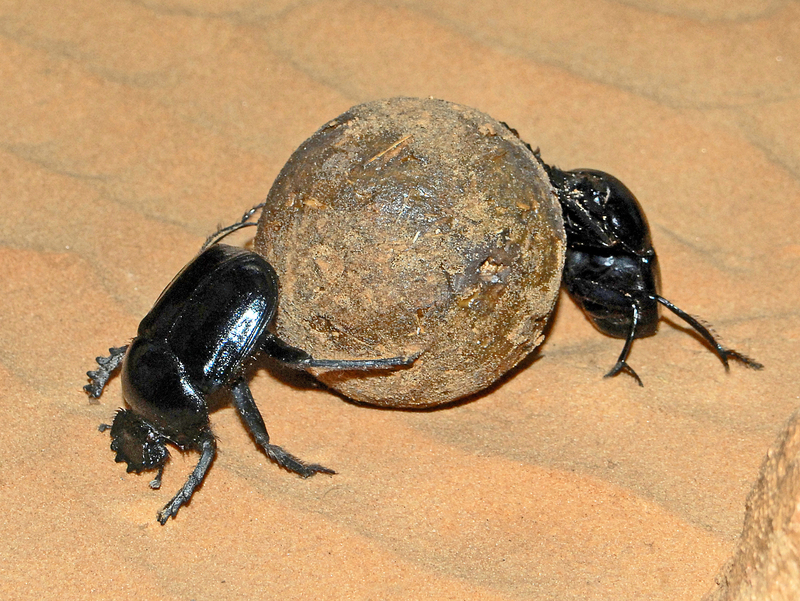 Two dung beetles rolling a ball of dung. Photo by Hectonichus (2014); image extracted from Wikimedia Commons. The scarab beetle then became a symbol of this god or, more specifically, of one of the forms of this god known as Khepri, which represented the sunrise and early morning. Khepri was portrayed either as a scarab beetle or as a human man with a scarab as a head. Wall-painting of Khepri in the tomb of Queen Nefertari (Valley of the Queens; 19th Dynasty, New Kingdom). Photo by Waiyenoo111; image extracted and modified from Wikimedia Commons. 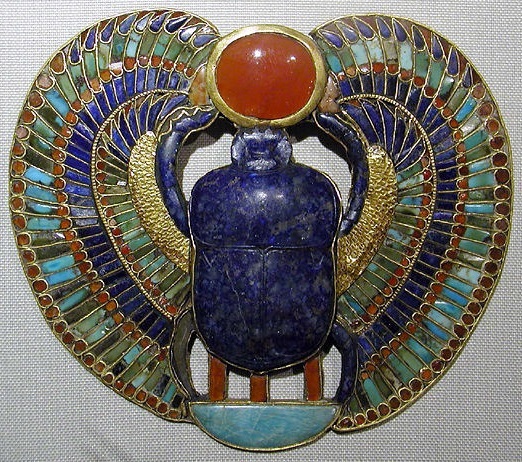 As a symbol of the sun-god, scarabs became widely popular imagery for amulets in Ancient Egypt, especially from the Middle Kingdom onwards. These were mainly apotropaic amulets, which means they were used for protection, to ward off evil. Scarabs would protect both the living (people wore them as necklaces) and the dead (they were placed in the wrappings of the mummies). A solar scarab pendant from the tomb of King Tutankhamun (Valley of the Kings; 18th Dynasty, New Kingdom). Photo by Jon Bodsworth (Egypt Archive); image extracted and modified from Wikimedia Commons. Krypt King is a skylander belonging to the famed group called “Trap Masters” (from the game Skylanders: Trap Team, as one might suspect). According to the game’s lore, he was a knight roaming the world as a disembodied spirit, until he found his suit of armor in some Arkeyan ruins. 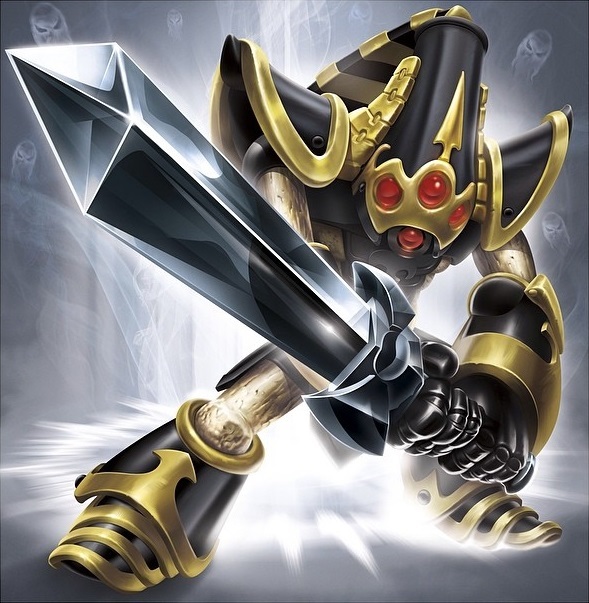 The black and golden color combination of Krypt King’s armor was not very common in Egyptian clothing and artifacts. It was occasionally used by Egyptians, though; for instance, in the depictions of the black jackal-god Anubis and in several objects of King Tutankhamun’s treasure. 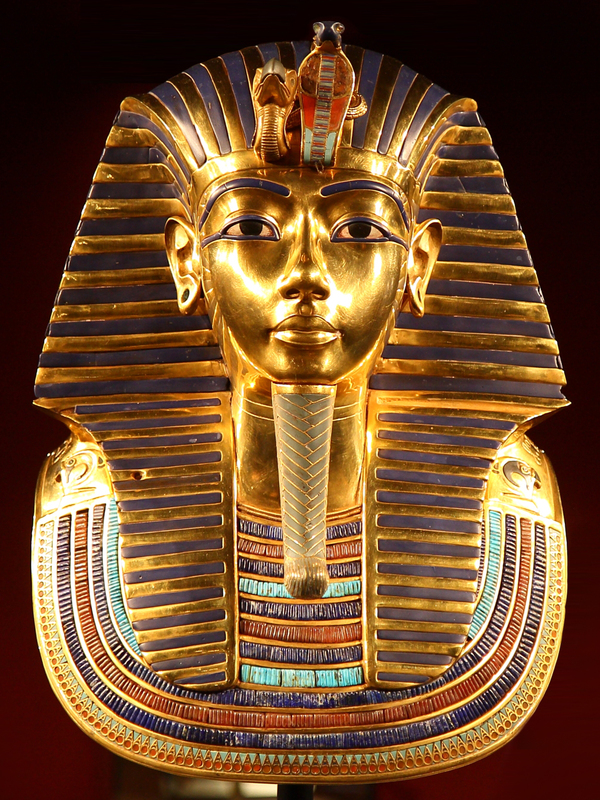 Nevertheless, this color combination became somewhat symbolic of Egyptian stuff in modern times. Perhaps this is due to the above-mentioned treasury of the boy-king Tutankhamun, which has always received extensive media attention. Krypt King (official artwork from the game). Image extracted from Skylanders Wiki. The armor in itself is very stylized, seemingly made of metal, with broad shoulder plates, bracers and boots. This is definitely not even close to what ancient Egyptian armor looked like. Armors back then were a simple thing. In truth, for a long time there were no actual armors to speak of and only shields were used for protection. Only in the New Kingdom proper armors began to appear, first made of several layers of cloth and/or leather and later covered with metal scales. Of course, this would make Krypt King look rather weak, so in this case accuracy properly gave way to awesomeness. Krypt King’s headdress is very Egyptian-like; it looks like a fusion of the nemes headdress with the white crown. The nemes is a yellow and blue striped headdress worn by pharaohs in daily life. It is known from depictions as early as the 3rd Dynasty, although there are some possible depictions of a nemes from the 1st Dynasty. The nemes almost always comes with a uraeus, the stylized rearing cobra on the forehead of the headdress. The uraeus is a symbol of the goddess Wadjet and represents sovereignty. The golden mask from Tutankhamun’s mummy, shown wearing the nemes headdress (Valley of the Kings; 18th Dynasty, New Kingdom). This particular nemes features both the uraeus and the vulture image of the goddess Nekhbet. Photo by Ibrahim.ID & D. Levy (2014, 2015); image extracted from Wikimedia Commons. The pharaoh also had a number of more ceremonial and ritualistic crowns. The white crown (or hedjet) represents rulership over Upper (southern) Egypt. The red crown (or deshret) represents rulership over Lower (northern) Egypt. They were together combined as the so-called double crown (or pschent), meaning that the pharaoh ruled over the whole land. 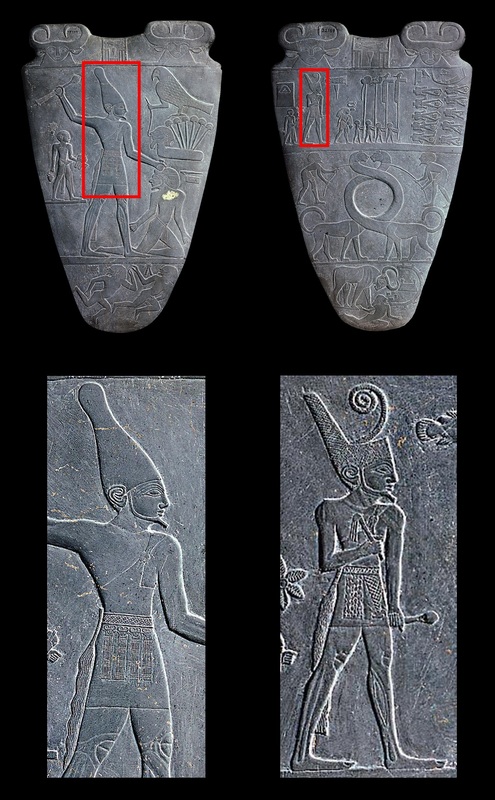 The two crowns are already seen in the depiction of King Narmer, the founder of the 1st Dynasty and mythical unifier of Egypt. The white crown can also be seen in kings from the so-called Dynasty 0, i.e., before the total unification of the land. Top row: The two sides of the Narmer Palette (Abydos; 1st Dynasty, Early Dynastic Period). The red squares mark where the king is shown wearing the white crown (left) and red crown (right). Photo by Nicolas Perrault III (2013); image extracted and modified from Wikimedia Commons. Bottom row: Expanded view of the areas delimited by the red squares above. As stated above, Krypt King wears a headdress that seems to fuse the nemes and the white crown into one. This is actually (more-or-less) seen in Ancient Egyptian art: the nemes is sometimes depicted combined with the double crown. Statues of Ramesses II from the temple at Abu Simbel (19th Dynasty, New Kingdom), shown with a headdress combining the nemes and the double crown. Photo by Merlin-UK (2007); image extracted and modified from Wikimedia Commons. Last but not least, there is Krypt King’s sword. Needless to say, his large sword is clearly based on medieval European weapons. As with all metalworking in early historic periods, swords in Egypt were not that large. Moreover, the typical Egyptian sword is very unique and more-or-less sickle-shaped. It is called khopesh (can also be spelled khepesh) and is known at least since the First Intermediate Period. Khopesh were first made of bronze (luckily, copper mined in Egypt contains a high amount of arsenic, which makes the final product harder), but later on in the New Kingdom, iron started to be used. A khopesh found in Nablus, a city near Jerusalem (ca. 1750 BCE); as usual, the hilt was not preserved. Photo by Dbachmann (2006); image extracted and modified from Wikimedia Commons. Krypt King could have had a khopesh; it actually would have made him more unique (not to say more accurate too). This is especially true because there are already so many sword-wielding skylanders (even including another Trap Master!). The Golden Queen is not your usual skylander. Rather, she was the main antagonist (alongside the ever-present Kaos) in Skylanders: Trap Team. In this game, you can capture the villains and make them work for the greater good; that means you can play as the villains too! She became a full-fledged character in Skylanders: Imaginators, appearing as a “rehabilitated” villain (and with the mandatory accompanying real-life toy). 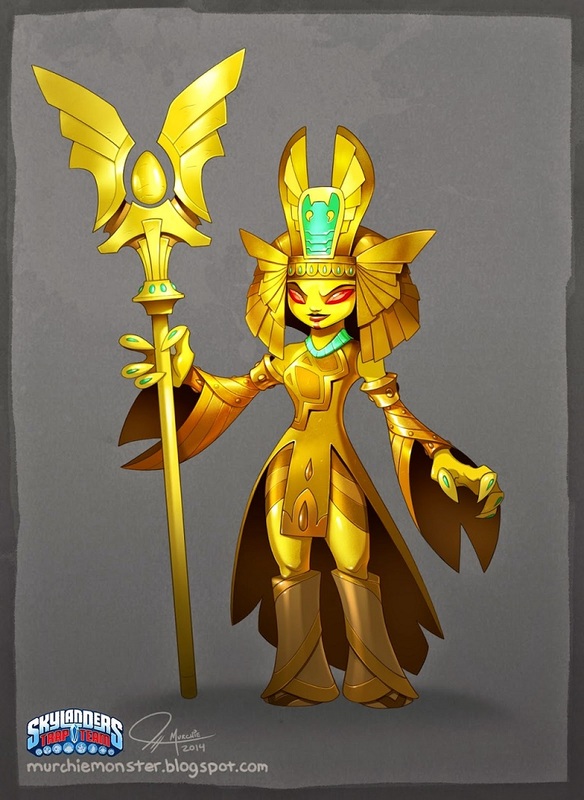 Golden Queen (official artwork from the game). Image extracted from Skylanders Wiki. By this point, it is very obvious that Golden Queen is clearly based on Egyptian themes. Like the Krypt King, she wears a nemes headdress, albeit very stylized. This is befitting of a pharaoh, but not of a “simple queen”. Queens that later became pharaohs, like Hatshepsut, wore male clothing and regalia, as appropriate for the office of pharaoh. Golden Queen’s nemes aptly bears a uraeus, a huge and very stylized one at that. A curious feature of Golden Queen is the vertical lipstick-like stripe painted below her mouth. Perhaps the intention of this painting was to resemble the typical “false beard” worn by pharaohs. (To get an idea of what this beard looks like, take a look at the figure above showing the golden mask of Tutankhamun’s mummy). This ceremonial beard was, of course, also symbolical and indicated an association of the pharaoh with the gods. 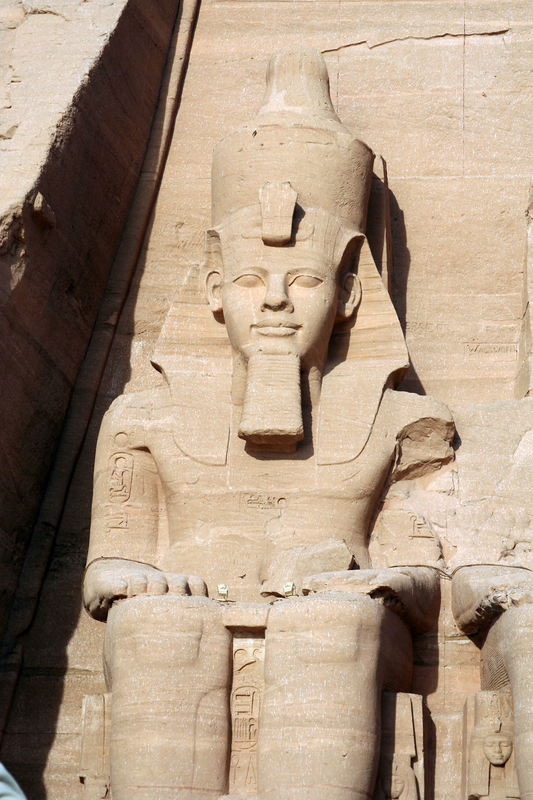 The pharaoh, after all, acted as the single intermediate between mankind and the divine. 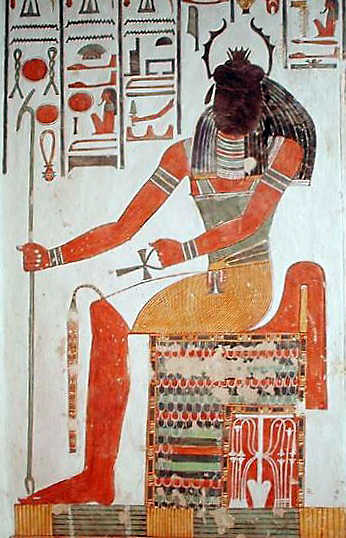 The Pharaoh Hatshepsut (from her funerary temple at Deir el-Bahri; 18th Dynasty, New Kingdom) is here depicted in male pharaonic clothing, but still shows a feminine form. Later on, she was depicted entirely as a male. Photo by Captmondo (2007); image extracted and modified from Wikimedia Commons. So now let’s analyze all the gold. Why is the Queen golden? Well, according to the games’ lore, she is actually made of gold (and can even regenerate by absorbing gold). This has precedence in Ancient Egypt, albeit on the divine realm. Egyptian myths tells us that the flesh of the gods was made of gold, while their bones were silver. (The exception was the powerful Set, god of the desert and disorder, whose bones were made of iron.) So the Golden Queen appears to be more godlike than a mortal ruler under this light. Of course, it was usual for the Pharaohs to be eventually depicted in a more godlike manner. Staves and scepters are symbols of power and dominion, and thus rulership, in many (if not most) cultures of the world. This was also the case in ancient Egypt. Pharaohs and gods (and sometimes important members of the priesthood) were depicted carrying the was-scepter or the sekhem-scepter. (Pharaohs could also be depicted carrying other similar symbols, depending on the occasion, such as the mace, the crook and the flail.) The was-scepter represents power and dominion; it consists of a usually long vertical shaft with a forked base and is surmounted by an animal head (commonly the so-called “Set-animal” of the god Set). The sekhem-scepter denotes power and might; it consists of a short vertical shaft surmounted by a fan-like or spade-like structure. Golden Queen’s staff is strikingly different from both (although maybe closer to the sekhem-scepter), having a pair of wings and a central egg-like structure. More importantly, the Queen can shoot golden scarabs from her staff and summon a swarm of these beetles. The meaning of scarabs for the Ancient Egyptians is explained above, in the section about Dune Bug. She can also use the staff to turn anyone or anything into solid gold. Alternatively, she can do this with a touch, an ability that comes from Greek myths, namely the story of King Midas. 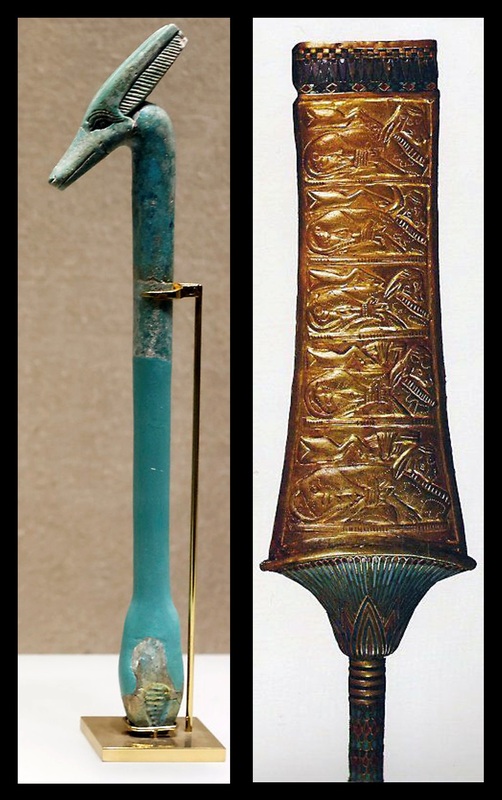 Left: A was-scepter made of faience (its center portion was restored) from Nubia (Late Period). The animal head represents the god Set. Photo by Joan Lansberry 1995–2012; image extracted and modified from http://www .joanannlansberry.com. Right: Head of a sekhem-scepter, made of wood with gold covering, from the tomb of Tutankhamun (Valley of the Kings; 18th Dynasty, New Kingdom). Anonymous photo; image extracted and modified from http://ancienthistorysymbols.tumblr.com. Finally, Golden Queen has a boat in the Skylanders: SuperChargers game. The vehicle is called Glitter Glider, perhaps because the name Golden Glider was already taken by DC Comics. Despite obvious additions (like the motor), her boat is indeed based on ancient Egyptian vessels, especially known by their high curving prow and many oars. Top: Golden Queen on her boat (screenshot from the game). 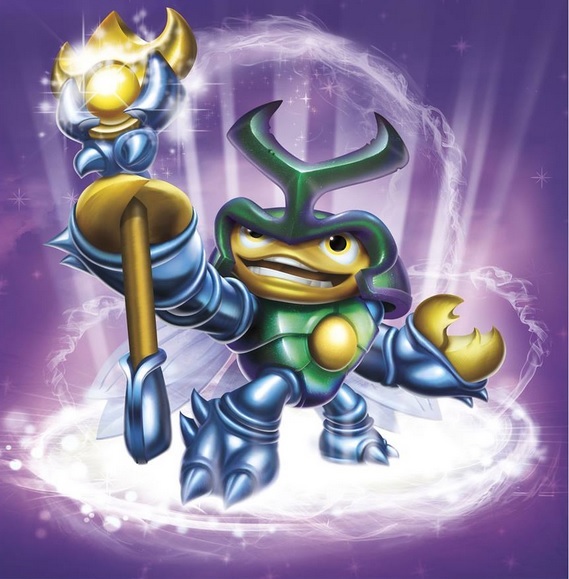 Image extracted from Skylanders Wiki. 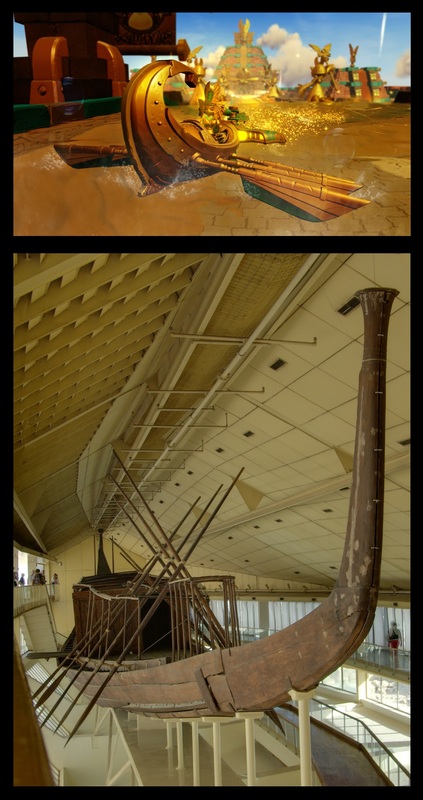 Bottom: Reconstructed “solar barge” of King Khufu (4th Dynasty, Old Kingdom), found in the king’s pyramid complex in Giza. Photo by Berthold Werner, 2010; image extracted and modified from Wikimedia Commons. Grave Clobber is a minor villain, featured as a playable character in Skylanders: Trap Team. He is summoned by the Golden Queen to get rid of the skylanders. By his wrappings, Grave Clobber is clearly a mummy. But that’s where all Egyptian influence stops. Actually, everything else in Grave Clobber looks influenced by Mesoamerican cultures: the geometric patterns, the ugly scary mask and the typical turquoise blue color (the pigment called “Maya blue”, or “azul maya”, from the Spanish). Grave Clobber (official artwork from the game). Image extracted from Skylanders Wiki. Like for Grave Clobber above, Golden Queen’s stages (The Golden Desert and Lair of the Golden Queen) are all ornamented with reliefs and patterns that are more reminiscent of Mesoamerican cultures than ancient Egypt. This is especially true for the pyramid, which is a step pyramid with a flat top. Such buildings are well known from archeological sites in Mexico, but not in Egypt (although the very first pyramid built, by pharaoh Djoser, was stepped). 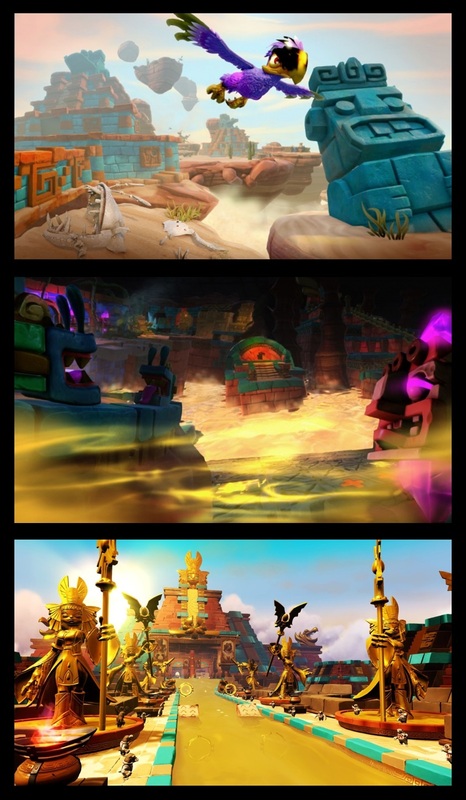 Golden Queen’s racing stage from Skylanders: SuperChargers (called “The Golden Temple”) also shares a lot of this Mesoamerican style. Top: Golden Desert stage, from Skylanders: Trap Team (official artwork from the game). Middle: Lair of the Golden Queen, from Skylanders: Trap Team (official artwork from the game). Bottom: The Golden Temple stage, from Skylanders: SuperChargers (screenshot from the game). All images extracted from Skylanders Wiki. As we can see by the above discussion, the Skylanders series incorporates some nice elements from ancient Egyptian culture. It presents some things in a sensibly accurate manner, while accommodating other things in a more forceful manner due to gameplay and/or artistic choices. Some things, however, are unnecessarily mistaken, like Krypt King’s sword and the Mesoamerican pyramids. Adams, B. (1994) Egyptian Mummies. Shire Publications, London. Burton, R.F. (1884) The Book of the Sword. Dover Publications [1987 ed. ], Mineola. Emlen, D. (2014) Animal Weapons: The Evolution of Battle. Henry Holt & Co., New York. Hall, R. (1994) Egyptian Textiles. Shire Publications, London. Lurker, M. (1984) Gods and Symbols of Ancient Egypt. Thames & Hudson, London. Miller, M.E. (1999) Maya Art and Architecture. Thames & Hudson, New York. Partridge, R.B. (2002) Fighting Pharaohs: Weapons and Warfare in Ancient Egypt. Peartree Publishing, Havertown. Pasztory, E. (1998) Pre-Columbian Art. Cambridge University Press, Cambridge. Peck, W.H. (2013) The Material World of Ancient Egypt. Cambridge University Press, Cambridge. Reyes-Valerio, C. (1993) De Bonampak al Templo Mayor: El azul maya en Mesoamérica. Siglo XXI Editores, Mexico D.F. Salvador, R.B. (2015) Egyptian mythology in the Shin Megami Tensei: Persona games. Journal of Geek Studies 2(1): 8–32. Salvador, R.B. (2016) The overwatching eye of Horus. Journal of Geek Studies 3(2): 01–07. Scheel, B. (1989) Egyptian Metalworking and Tools. Shire Publications, London. Shaw, I. (1991) Egyptian Warfare and Weapons. Shire Publications, London. Skylanders Wiki. (2016) Available from: http://skylanders.wikia.com/ (Date of access: 19/Mar/2016). Teeter, M. (2011) Religion and Ritual in Ancient Egypt. Cambridge University Press, Cambridge. Tyldesley, J.A. 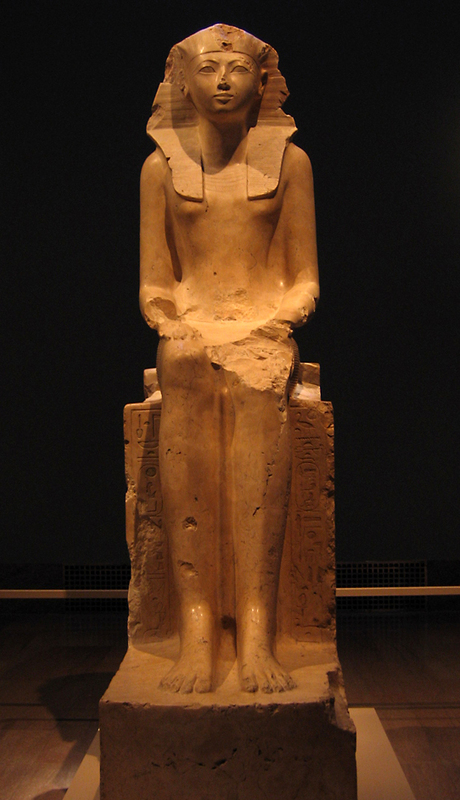 (1998) Hatchepsut: The Female Pharaoh. Penguin Books, London. Vinson, S. (1994) Egyptian Boats and Ships. Shire Publications, London. Rodrigo Salvador remains fascinated with Ancient Egypt and often stops to ponder about it, even while fending off wave after wave of nasty Chompies.